Okay, so it's not a car, a bike or even a hovercraft. It doesn't transform into anything. It apparently didn't even work all that well in its designed capacity. What is it? 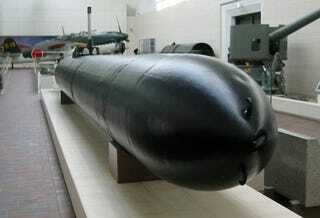 It's the WWII Kaiten, a Japanese invention of dubious genius that was designed to be a piloted torpedo. Motor in the back, a ton-and-a-half of HE in the nose and one or two sailors in the middle. To be honest, we can't decide whether we think it's totally rad or ridiculously creepy. Somehow, though, we can't help but applaud its desperate spirit.